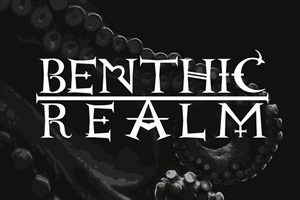 Quickly following up their self-titled debut EP of last year, doom metal trio Benthic Realm have shifted drummers in the interim – gaining Conclave member Dan Blomquist who will be continuing in both bands. We Will Not Bow is a four-song adventure into what makes this genre so appealing and enticing to the primal fan – boiling things down to the essence of hypnotic parts and hooks that make the listener participate in mutual fist flailing hair windmills as the heads bang until they can bang no more. The expansion of the band’s horizons takes place in more of the subtle nuances than anything direct for curveballs. It can be the blackened screams that occur out of guitarist/vocalist Krista Van Guilder during the conclusion of “Save Us All” – where Dan teases a plodding drum conclusion only for the guitar and bass to crest again in a crushing final salvo. Or the stair step bass action of Maureen Murphy during the title track instrumental that allows Krista and Dan to lock onto some serious doom grooves where they blend together everything from Candlemass to Trouble in terms of phrasing, atmosphere, and versatility. The poetic, personal nature to Krista’s lyrics and her equally majestic voice makes “Untethered” a favorite – the churning nature to the riffs and subsequent half-step doom transition aiding the dark nature to the track, many of the chord combinations and lead break taking on exotic and extreme textures within the natural doom platform. In under 25-minutes, most will be pressing play again, wanting another aural cleansing to channel all their daily turmoil into something manageable to get through that next day. These members have decades of experience not just in heavy metal, but playing and performing in the doom sub-genre. Benthic Realm as a result channels that passion in the right direction – hitting upon the right riff to hook to groove combinations, allowing Krista’s captivating melodies to bring these songs into the memory banks. 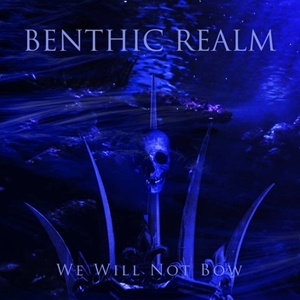 We Will Not Bow doesn’t break you – it’s an invitation into the coven, letting us gather for a fruitful musical bounty that hopefully will be productive for many seasons to come.